ABUJA— The suit filed by the leader of the Indigenous People of Biafra, Mazi Nnamdi Kanu against the Federal government of Nigeria, over his illegal detention and denial of bail and enforcement of his fundamental rights, scheduled to be heard today at the ECOWAS Community Court of Justice sitting in Abuja, commenced after a long waiting of the Federal government’s legal representatives which made the court switch to another case while waiting for their arrival as it gave the assurance of proceeding to hear the suit regardless of whatever happens. At exactly 12pm, after hearing of the first case, the suit lodged against the Nigerian government was called up for hearing. 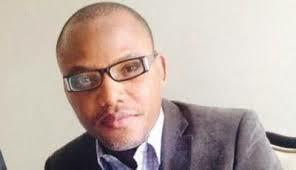 The FG defence counsel filed an additional case charges against the IPOB leader, but the three-panel of presiding judges, led by Justice Friday Nwoke, blasted the government's defence team saying, “this is not the rule of law.” The judges, there after called upon Kanu’s legal representative led by Barrister Ifeanyi Ejiofor to present their case while ignoring the FG's team. Kanu's legal counsel, Barrister Ejiofor, objected the Federal government's application in filing fresh additional charges on the grounds that the original charges has not been settled and disposed off. Ejiofor narrated to the panel of judges, how the Nigerian government have been delaying the his client's trial by the introduction of judicial gimmicks to keep Kanu in unlawful detention, adding that that is what they came to achieve today in court by the addition of fresh charges against his client. When called upon for his defence, the FG's counsel delayed for some minutes before insisting that fresh charges needed to be included in the case. The ECOWAS court once again reiterated that his prayer for fresh charges did not have grounds in the existing constitutional framework. On Barrister Ejiofor’s further objection, the regional court told him to note all the errors and present it after the FG's legal representative must have been through with his submissions. Bereft of any further issues to present to the court, the FG defence counsels, all seated down in shame as speechlessness enveloped them. The Nigerian government defence counsel strongly wanted the additional charges to be hurriedly added this same day hearing is held, they tried forcing the new charges’ files at the court when the court has not given his final ruling. However, Ejiofor stood up and tabled a good explanation on how the regional court works and why it should remain strong to stand firm for justice which they have been known for years. He also narrated to the court how the Nigerian government refused to release Nnamdi Kanu unconditionally as against the judicial rulings of previous judges, adding that this shows a clear disobedience to the rule of law. The Court subsequently submitted to adjourn the case for it's final judgment on a later date but this was vehemently opposed by Barrister Ejiofor who wanted the court to pronounce its ruling immediately. The presiding judge, Justice Nwoke held that they needed to adjourn its ruling to a later date, as they have other issues to look at and investigate before making its final pronouncement. Consequently, the date for the final judgment was fixed to hold next year's February 9 for their judicial pronouncement.